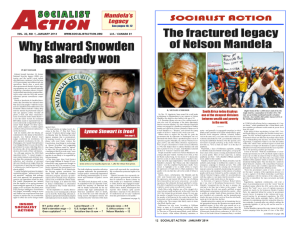 From the archives: This article appeared in the May 2010 Socialist Action newspaper. Participating also from the far right wing of politics were Doug Bandow, a former Reagan aide now with the Campaign for Liberty; Jesse Walker from the Libertarian Reason magazine; Daniel McCarthy from the Buchananite American Conservative magazine; Jeff Taylor from the traditionalist conservative Front Porch Review; a Naval Academy professor; staff from the Ron Paul campaign; and students from the Ron Paul-inspired Young Americans for Liberty. Liberal editors and intellectuals who attended included Katrina van den Heuvel and William Greider from The Nation, as well as Sam Smith of the Progressive Review. Ralph Nader and Michael McPherson, the executive director of Vets for Peace, were in attendance too. This coming together of “left” and right was inspired, according to the organizers, by the example of the American Anti-Imperialist League that opposed the occupation of the Philippines in the late 19th century and the America First Committee pulled together in 1940 to fight U.S. entry into World War II. Paul Buhle also claimed to be inspired by an unsuccessful attempt by the Madison SDS to work with “no foreign entanglements” conservatives near the end of the U.S. intervention in Vietnam. Are Buhle and Benjamin, both well respected as activists, correct to champion the possibility of constructing an antiwar coalition led by right and left? Is this a clever way to reinvigorate a weak movement? Or is it a dead end for those who want to rebuild a massive movement in the streets to bring the troops home now? Is the America First Committee the model antiwar activists should be emulating today? The years leading up World War II were years of unprecedented union militancy and mobilization in the U.S. From the groundbreaking strikes of 1934, which included the Minneapolis Teamsters, the Toledo Auto-Lite, and the West Coast longshore strikes, to the United Autoworkers victory at Ford Motors in 1941, labor was on the move. Their militant opposition to the war and wartime assaults on the rights of workers to defend their standard of living led the government to indict leaders of the Socialist Workers Party and the Minneapolis Teamsters under the Alien Registration, or Smith Act. Their sentencing took place on Dec. 9, 1941, at the same hour that Congress was formally declaring war. Their attempt to provide a pole of opposition to the war that was working class in its outlook was cut short by this attack and by their small numbers. The America First Committee was initiated with quite different goals than those motivating the antiwar demands of U.S. soldiers in the Far East. In 1940, a group of wealthy Americans—led by Robert D. Stuart Jr. (later the CEO of the Quaker Oats Company) with the backing of executives from Sears Roebuck, the Whiting Corporation, Hormel Meat Packing, Inland Steel, and Morton Salt—joined with the master of the National Grange, the head of the Chicago Theological Seminary, and a former editor of The Nation to form the committee. America First spokespeople ranged from Socialist Party leader Norman Thomas to the anti-Semitic and reactionary Charles Lindbergh. James P. Cannon, a Socialist Workers Party leader indicted with the Minneapolis Teamsters under the Smith Act, was of the view that the “isolationists” in elite circles merely held a tactical difference with those of their peers who were for sending U.S. armaments to Britain. Those opposed to early entry into the European war, Cannon warned at the time, believed that the U.S. should consolidate its political and economic hold over the Americas before intervening into the European colonies in the rest of the world. The “Left-Right Alliance” against the war has gained a hearing at all only because of the popularity of Texas Congressman and 2008 presidential candidate Ron Paul among veterans, students, and disappointed antiwar activists. Paul, who is an avowed right-libertarian in political outlook, has come out as a strong opponent of the U.S. interventions in Iraq and Afghanistan. His advocacy of immediate withdrawal, in the context of the continued funding of the war by the Democratic majority in Congress, has given him tremendous credibility among those disgruntled with government policy and with the inability of the currently existing antiwar movement to force the war’s end. As conceived by Kevin Zeese, the “Left-Right Alliance” would be composed of the big liberal antiwar organizations, and the extra-electoral organizations of Ron Paul and his fellow far-right opponent of the wars, Patrick Buchanan. Paul and Buchanan, for Zeese, represent the Libertarian and Paleo-Conservative wings of the right, strains of conservatism that oppose the current U.S. military interventions as detrimental to the real security of the nation. While many antiwar activists would shudder at the name of Patrick Buchanan, a figure usually characterized as neo-fascist in outlook, some have misunderstood Ron Paul’s libertarian politics as somehow progressive. What is Ron Paul’s social program? Libertarians believe that the basis of human and individual freedom is private property. They strive to limit the scope of federal government, which they view as created to steal personal wealth. In Paul’s view, the less government the better. His goal is to eliminate all of the federal social programs wrested from the U.S. ruling class by working people over the last century and a half. Such programs include not only welfare, Social Security, and Medicare but even public education. On a recent Chris Matthews TV interview, Paul explained that Social Security is immoral, because it forces responsible people to pay for those who were irresponsible enough not to save money for their retirement when they were young. Even more extreme are Paul’s views on race and gender equality. According to Paul, fighting for Black rights or women’s rights is illogical, as the categories of oppressed nationality and gender are false constructs when it comes to thinking about liberty. The only basis on which he believes one can meaningfully struggle for freedom is as an individual property owner. Paul has stated that the Civil Rights Act had terrible consequences for the United States and would not vote for such legislation today. He argues that the children of immigrant workers should be denied schooling and emergency room treatment, since too much “welfare” is drawing immigrant workers to the U.S. In fact, he voted for a bill requiring hospitals to turn in immigrants who sought medical help. He also opposes giving citizenship to children born in the U.S. of immigrant parents. And while Paul is for withdrawing troops from the Middle East, he has voted in favor of deepening the militarization of the border with Mexico. Perhaps most ominously, Paul sponsored a bill making it illegal for the border patrol to interfere with the 7000 anti-immigrant vigilantes of the Minutemen Project, because their help has been “productive and good.” He also votes to deny visas to students from any country that “supports terrorism” or inadequately fights terrorism, as defined by the U.S. government. Paul is an obstetrician who calls abortion murder and sees Roe v. Wade as an assault on the Constitution. To be a consistent civil libertarian, Paul argues, one must defend the rights of the “unborn.” Roe v. Wade, and many other federal civil liberties and civil rights rulings and legislation, are, according to Paul, attacks on states’ rights. What kind of unity is needed? The history of the fight against U.S. intervention into Vietnam, along with the experience of the civil rights, women’s liberation, and labor movements, shows that the kind of activity needed to move the U.S. corporate elite to accede to our demands, is mass independent action in the streets. The ruling-class parties gage the power of such a movement by its size and social composition. A movement that reaches deep into the working class, the class who machines the weapons, transports them to the theater of operations, and then populates the armies is their biggest nightmare. During the Vietnam War, the U.S. Army, witness to the heroism of the Vietnamese and supported by a giant antiwar movement at home, eventually refused to fight Washington’s war. Building a movement with this kind of intrinsic social power should be our goal. San Francisco Socialist Action event poster, 2010.
the antiwar movement must be a safe place for the most militant and combative components of the unions and of community struggles. It must seem relevant to those whose first waking thought is how to find a job or keep their house. It must be welcoming to the 200,000 LGBT activists who recently marched on DC. A united front with the anti-interventionist far right, on the other hand, would require that our movement drop its demand for “Money for Jobs, Not War!” It would advertise mass actions by promoting a list of speakers that included the viciously anti-immigrant Paul and Buchanan at a time when the fightback against the racist Arizona law is among the most important working-class struggles in the U.S. It would feature Paul supporters who hail his effort to keep Arab and Muslim students out of the U.S. It would naturally draw in the openly racist Tea Party elements. Such a “united front” would make the antiwar movement uninhabitable by those most crucial to its success. The unity that we need in the antiwar movement today is the kind of unity exemplified by the United National Antiwar Conference to be held in Albany, NY, on July 23, 2010 (see www.nationalpeaceconference.org). Here veterans, unionists, community activists, faith communities, Muslim Americans facing a new witch hunt, and civil libertarians fighting not only the Patriot Act but the Arizona law as well will join with international guests to find ways to revive mass action for the immediate withdrawal of all U.S. troops, mercenaries, and bases from the Middle East and South Asia. It is on this kind of basis that the new “broad” antiwar movement will be built.